Farhad Arbab at SUT 2016 celebration event. Picture by SUT. 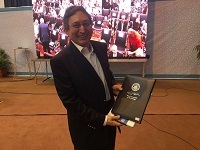 CWI researcher Farhad Arbab was honoured by Sharif University of Technology in Iran as one of its fifty most outstanding alumni over the past fifty years. The alumni were selected for both their technical achievements and service to the society. Sharif University is known for its top level students. One of the other selected alumni was Maryam Mirzakhani, the first female researcher ever to win the Fields Medal, the highest reward in mathematics. The university’s 50th anniversary was celebrated in Tehran on 18 May. Farhad Arbab studied at the Aryamehr University of Technology before he left Iran in 1977. He is now a senior researcher in the Formal Methods research group at CWI and a professor of Computer Science at Leiden University. He is well known for his research on concurrency, distributed and component based software, and coordination languages, such as Reo. The Aryamehr University was renamed Sharif University of Technology in 1980. It is now one of the largest engineering schools in the Islamic Republic of Iran. It has 300 full-time faculty members, 430 part-time faculty members and about 12,000 students. More information (in Persian) on the anniversary: 50.sharif.ir. Picture 1: Sharif University of Technology celebration event in Tehran. In the front row are present and former university presidents and other officials. Farhad Arbab is the second person from the right in the second row. Picture source: SUT. Picture 2: Farhad Arbab with the certificate of recognition. Picture by Reza Samani.